I recently bought six plastic cups in different colours. 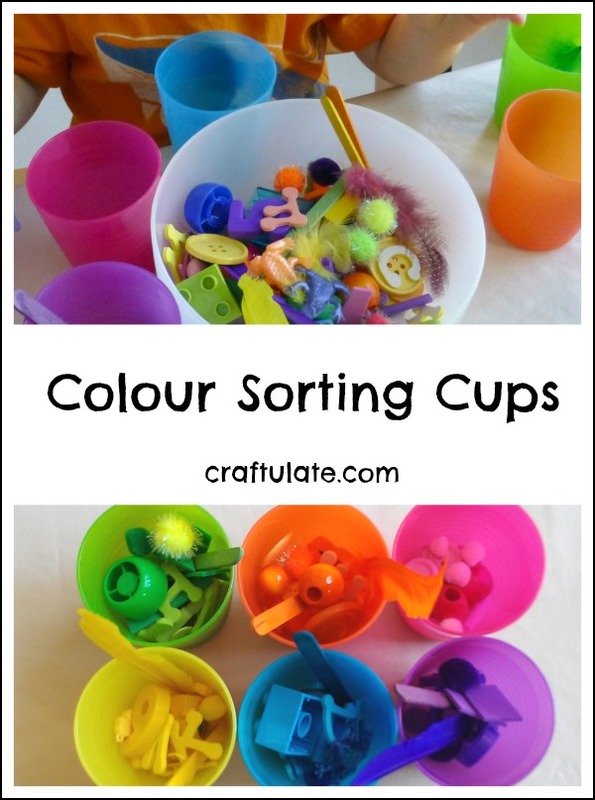 What possible use could they have other than to use them for a fine motor skills colour sorting activity? I was inspired by Thrive 360 Living who used small plastic containers with felt circles in the base. As the cups were coloured already I just had to collect the items to sort. 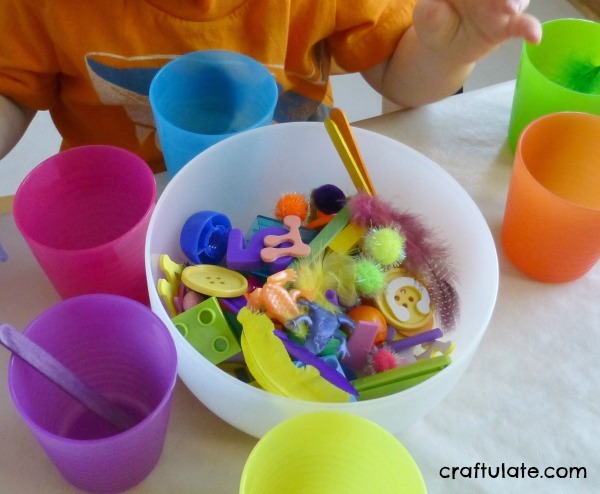 I collected a wide selection of things: feathers, magnetic numbers, Duplo blocks, bottle caps, foam bug stickers, pom poms, coloured craft sticks, beads, straws, foam letters, buttons and lots more! I just used whatever I had around that fit the six colours of the cups: pink, purple, yellow, green, blue and orange. You should be aware, however, that small items may be a choking hazard to young children, so take care when selecting. We recently completed a nine week series on learning colours with the animals from Brown Bear. There wasn’t a pink animal so I was pleased we could work on pink with this activity! 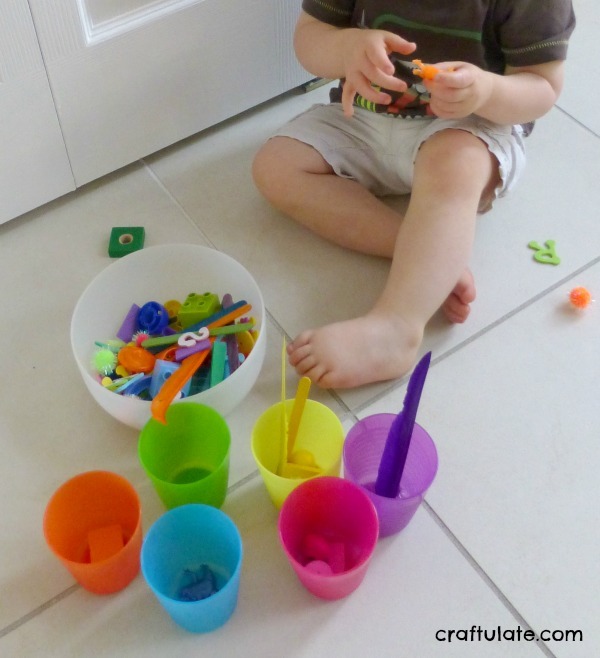 I set out the activity for F and as usual he wanted to investigate every single item! But when he did decide to put it in a cup, he chose the right colour. We continued over the next few days, and slowly made progress with sorting all the items. We talked about the colours as he picked up each item. Although he sorted them correctly, he would often answer “purple” if I held up either a pink or purple item. So we focused on the pink items for a while. I kept the activity going into the third day, and he still was enjoying checking out each item as well as sorting them. But with a *little* bit of help – he finally finished sorting!